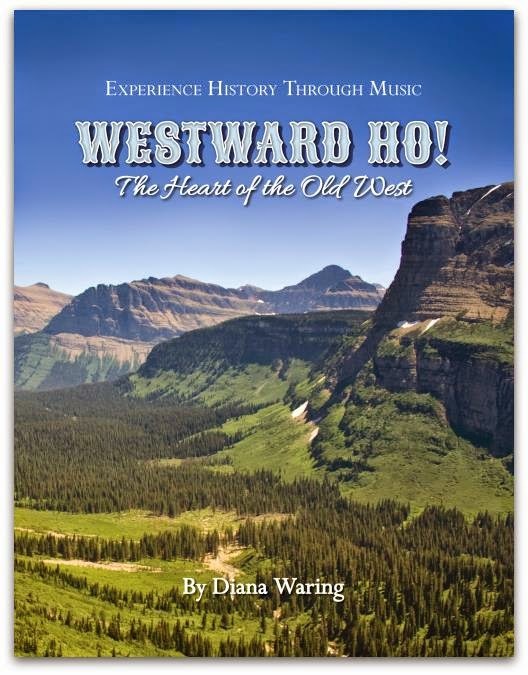 Diana Waring presents her Experience History Through Music book and CD combos. I was lucky enough to get to be on the review team to test them out. History was never a favorite subject of mine in school. I went to public school and my teachers were always dull and lifeless. I dreaded walking in the door as much as I did hearing what they had to say. Now check out Diana and try to tell me this woman is dull! Might I add that she has homeschooled her three children as well! Each book/CD combo costs $18.99 each. 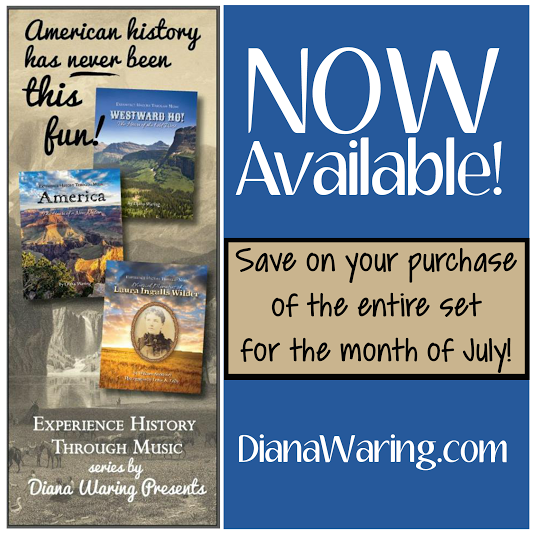 If you buy all three in July you can get the set for $50! 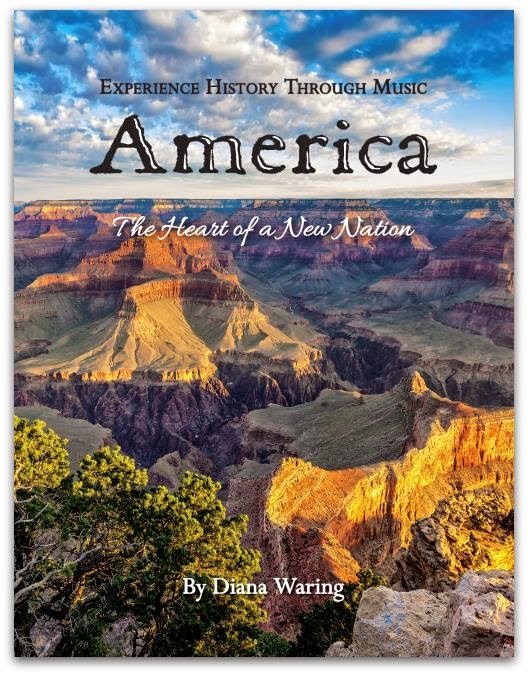 This book is about the French and Indian War to the first transcontinental railroad. The songs were mostly all familiar tunes from my own childhood and very catchy. This book is about the pioneers journey from leaving their home land and traveling. It has many stories that tell the good and bad of their travels and the music fits right along with it. Now this was my most favorite book and CD to review. This is of course about the life of Laura Wilder and things in that time period. Some songs are fun and playful while others are serious. All of these books have wonderful pictures and stories in them. The CD's are professional with high quality sound and music. They are fitted for all ages, my kids range from 6 months to 9 years old and everyone enjoyed some part of it. The books pictures show many things that are interesting and amazing. The Laura book expands more than any other pictures I have seen while studying her before. The chapters in the books go right in order with the songs on the CD as well. When we first got the sets in we decided to just listen to the CD's and get a feel for the music before we dived in. I also couldn't wait to hear them! So we put them in and turned the volume up while we did our chores for the day. It lead to some pretty awesome karaoke type singing and some sweet knee slapping dancing. Later we dived into each book reading a few of the stories and listening to the songs that go with them and talked about it more in depth. Some songs we listened to a couple times after reading the chapter that went with it because it helped us really try to feel what the song was really about. 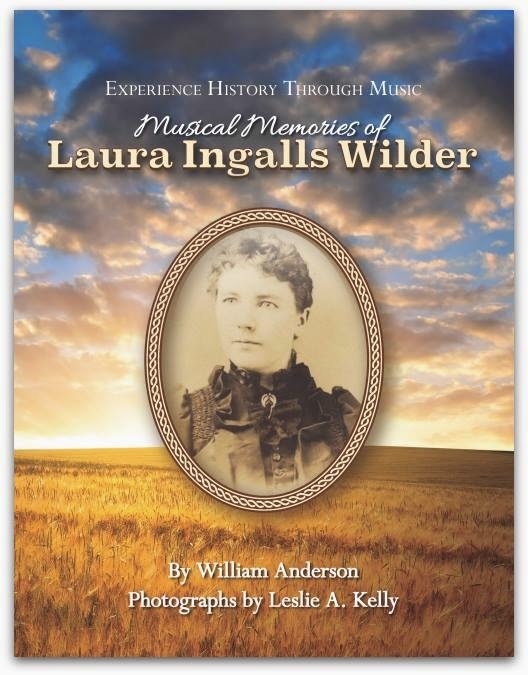 Our favorite however was Laura Ingalls Wilder of course. The thing is I grew up watching Little House on the Prairie when I was my kids ages. I also grew up close to Laura's home in Missouri. We visited it a few times and I will never forget those visits either. I was very happy to take my kids there and let them enjoy it as well. So they remember visiting, as well has having an "authentic" meal my mom main with a tin pail to carry the food and a tin cup to drink from. It really helped them keep interest in the book and learn more about her and correspond that to the things we learned at her house. I think since my older kids are girls it was easier for them to relate to her and envision her being their age and what kind of life she had versus ours. Overall I think these are great books. Making learning fun helps our kids stay engaged and after all that is what homeschooling is all about. 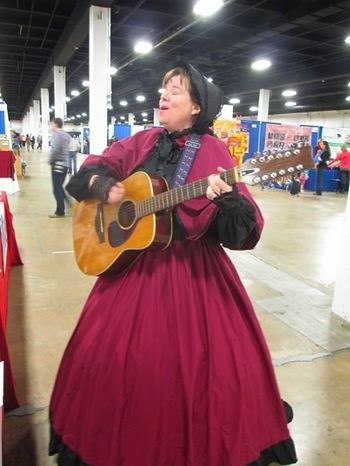 Get up and sing and dance and have a good time while learning what all those songs mean to these time periods. There are also sheet music in the books which my 9 year old loved. She always get out hymns and such to sing with and she was ecstatic to have these to sing along with the CD. By the way Diana is also a singer on many of these songs! Talk about a woman of talent!